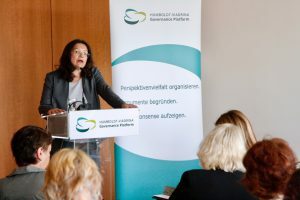 With the Green Paper ‘Work 4.0’ the Federal Ministry of Labour and Social Affairs (BMAS) introduced ideas for a broad discussion about the working world of the future. Against the backdrop of technological innovation and demographic and cultural change that come along with new requirements for the organization of work, the goal of the discussion was to identify pathways for an innovative working time policy. For this cause, the BMAS commissioned the HUMBOLDT-VIADRINA Governance Platform to realize two Trialogs to which representatives from the social partners, civil society organizations, companies and academia were invited. The results of the two Trialog events fed into the autumn 2016 launched White Paper ‘Work 4.0’. An innovative organization of working time requires a change of corporate and management culture. There is need for research into health burdens of knowledge work and multiple stresses from work and family responsibilities. It needs a societal dialogue on and the promotion of models for an individual organization of working time, e.g. in the form of long-term accounts of employment, which better provides for time requirements during a person’s life span. The return from part-time to full-time work should be legally secured. There is large potential in laboratories on resting hours and maximal daily working time, which preferably should be implemented by existing tripartite platforms. The goal of this Trialog was to steer immediate exchange between relevant societal stakeholders about the challenges and chances for an innovative organization of working time. Here, the Trialog discussants took account of employees’ interests as well as employers’ interests and existing wider interests of society. By means of argumentative exchange between stakeholders, the discussion revealed general consents, lines of compromise and dissents regarding options for working time and workplace. Furthermore, the Trialog explored options, steps and strategies for companies and the government to implement working time related innovations with the support of civil society. The second Trialog discussion was continued on the basis of the results from the first Trialog of the Dialogue on working time. Basic problems as well as practical obstacles, requirements and chances for a flexible organization of working time were collected and systematized in the discussion in order to jointly arrive at viable and workable solutions. The trialog explored possible laboratories for short-term flexibility needs of companies as well as for the protection of workers against excessive demand. Furthermore, it discussed chances for an organization of working time that pays respect to a person’s life span and to the principle of preferred work times.